Today's Recommend A is a cover with an animal on it. When dog trainer Delilah Gould spots a rambunctious Newfoundland disobeying orders, she can't help but stepping in and teaching the gentle giant to heel. But it's his hunky owner she's really like to teach a few tricks. Too bad he's clearly the untrainable kind. Professional hockey player Jason Mitchell is thrilled when he's traded to the New York Blades--the team of his dreams. There's just one problem: his pooch isn't adjusting to city life too well. Good thing he crosses paths with dog trainer Delilah Gould. At least that's what he thinks--until he realized he's fallen for her. 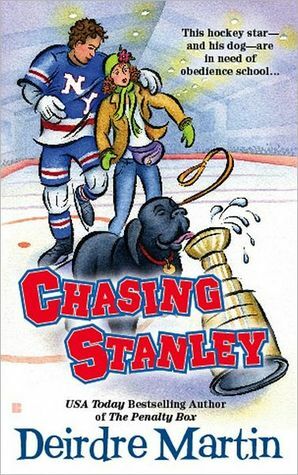 Now, with the season heating up, Jason realizes he'll have to score big-time to win the Stanley Cup and the woman who had tamed his dog and unleashed his heart. You guys know how much I love Hockey. So, I'm double recommending this novel and anything Miss Martin writes. There's no doubt that she is an adult romance writer. You'll love her and Stanley is the perfect pup. I love the title. The dog's name is Stanley and he is unruly. Delilah has to obviously chase him. BUT, Jason is chasing the "Stanley" Cup as a professional hockey player. Read it! Promise you'll enjoy it.